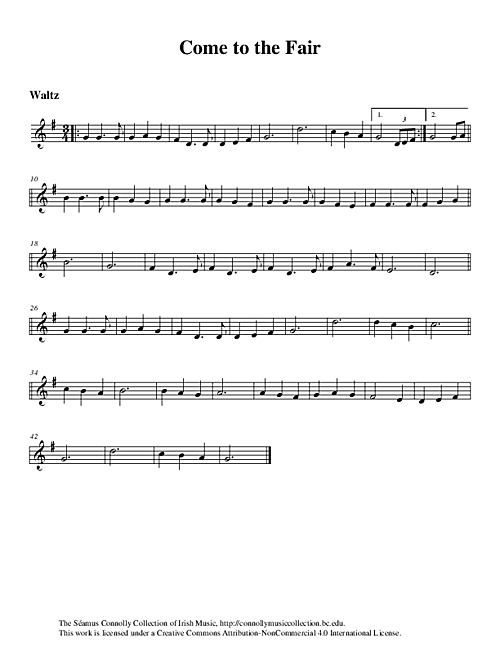 'Come to the Fair' was a very popular waltz/song played by The Kilfenora Céilí Band in the 1960s. I have always enjoyed listening to the band's singer Mary Higgins performing the song on a recording made at a céilí in Ennis in 1960. The recording of all of the tunes and songs played on that night was given to me to learn when I was invited to join The Kilfenora and embark on my first 'big' tour of England. What a thrill and an honour for me! The tune is performed here on this track by Tara Lynch (daughter of Jerry Lynch, the accordionist with the band in the 1950s) and myself. The track was enhanced by the musicianship of Gabriel Donohue on piano and keyboards. Lynch, Tara (accordion), Connolly, Séamus (fiddle), and Donohue, Gabriel (piano, keyboards), “Come to the Fair,” The Séamus Connolly Collection of Irish Music, accessed April 20, 2019, https://connollymusiccollection.bc.edu/document/725.